Pink and her husband Carey Hart have a long history of facing social media’s keyboard warriors head on. Hey parent police! Look over here! The couple are parents to seven-year-old Willow and two-year-old Jameson and a trip back through their Instagram feeds show some cheeky, chatty updates often addressing the ‘parent police’ directly. The popular couple are not only very confident in the way they’re raising their kids, they’re also not here for the parent shaming that is absolutely rampant on social media. They frequently bait their critics, and clap back at those who rudely criticise them or comment with negativity. Carey in particular has absolutely no tolerance for trolls and faux concern. And who can blame him when the barrage is so relentless? “We can’t possibly parent without you,” Pink joked in her caption of Jameson having a very fantastic time and of course the comments were dotted with “No offence, but …” or “Just my opinion!” type critical chatter. Helmets have been a consistent hot button on Carey’s Instagram account, with followers very often wondering a) where they are b) if they’re the right kind, or c) if the kids shouldn’t be home doing colouring in instead of tearing about having fun. “Stuffed the whole family on my bike, with out helmets, and we were hitting all the jumps. What you think parent police?” Carey quipped in his latest jab. Guns have popped up more than once on Carey’s account, and sparked quite a lot of discussion. This week he went a step further and addressed the circling critics directly, before explaining his family’s approach to firearms education and safety. “Haven’t poked the parent police bear in a few days,” Carey began in the caption for this photo of Willow learning to shoot. “Don’t worry parent police, I’m a professional,” Carey posted anticipating a flurry of concern in the comments of this photo (below). Of course he was spot on and while lots of people could not love this photo any more, others were worried that toddler Jameson’s helmet was sub par. This photo (below) provided an opportunity for Carey to poke fun at those who ‘wrap their kids in cotton wool’. Jameson and I idling around yesterday in ft. Lauderdale. Short ride since he was getting splashed and not to stoked. Don’t worry parent police, he is safe and I put him right back in his bubble when we were done. 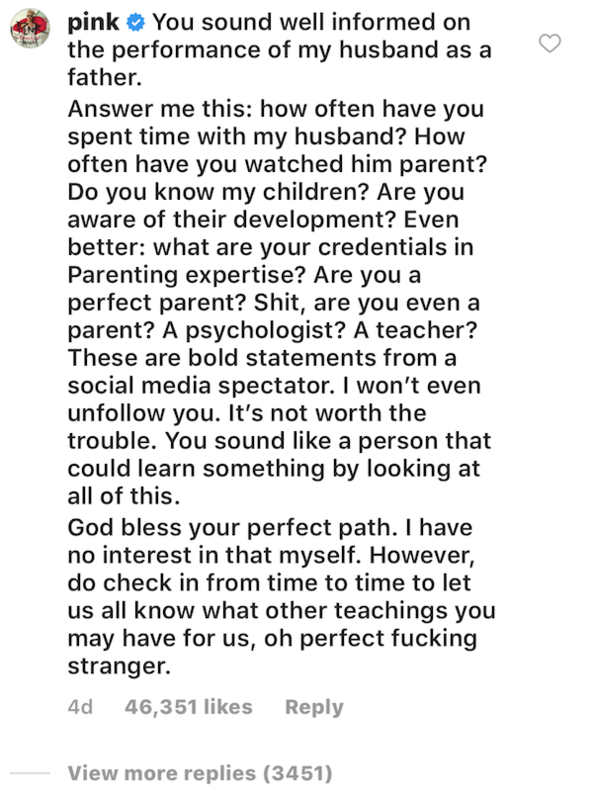 While these jabs at the parent police of Instagram are definitely tongue-in-cheek, they highlight the exhausting flow of negativity high profile people have to content with. It’s no wonder that that Pink and Carey are keen to change the conversation up and turn the spotlight back on those who push for perfection and think they know better.